There is a new super hero in town. But this is a super hero of a different kind – not a Marvel or DC super action figure hero but a female down to earth cop with the super power of survival. 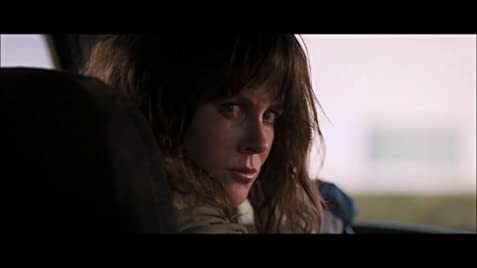 As the film opens, LAPD detective Erin Bell (Nicole Kidman) arrives on the scene of a John Doe murder and informs the responding officers that she knows the victim’s identity. The responding officers clearly dislikes her and unafraid to show their feelings. She gives them the finger when they ask the identity. At the police station, Erin receives a $100 bill stained from a dye pack in an unmarked envelope. Using a contact at the FBI, she confirms that the bill is from a bank robbery committed by a California gang many years prior that she and her former partner Chris (Sebastian Stan) were embedded in as undercover officers. She tells her superiors that she believes the bill and the John Doe murder to be proof that the gang’s leader Silas (Toby Kebbell) is once again active. Erin is forced to work her way through the remaining members of the gang in order to find Silas. She begins with Toby (James Jordan), who was arrested but is now gravely ill and living with his mother on compassionate release. She manually stimulates him in exchange for the location of Arturo (Zach Villa), a member of the gang who attempts to atone for his past crimes by offering pro bono legal services to immigrants. Arturo provides Erin with the location of DiFranco (Bradley Whitford), a lawyer who launders the money from the original robbery and from whom Erin deduces that Silas is active again because the money from the heist is almost gone. After threatening him, DiFranco gives Erin the location of the next money hand-off, which is performed by Silas’ girlfriend Petra (Tatiana Maslany). Erin tracks Petra, eventually intervening in a bank robbery committed by Silas’ new gang, and kidnaps Petra. But the beauty of all this is that there is more than meets the eye. Via flashbacks throughout the film, it transpires that Erin and Chris developed a romantic relationship while undercover, with Erin eventually becoming pregnant with Chris’ child. Nothing more will be revealed of the story but that it is a bit annoying at the start for the audience has to piece the puzzle of the story together. But the work pays off. The fragmented narrative works eventually. One also needs to take time after the film has ended to piece everything together to see how the time line has worked. 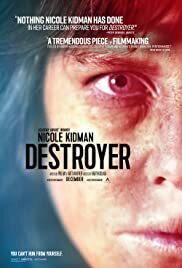 Kidman is marvellous and the almost unrecognizable Erin who strives for redemption for an undercover operation gone all wrong. She even stole the money. Kidman was nominated for a Golden Globe for her performance but lost out to Glenn Close. The young Tatiana Naslany also proves herself a rising star. The nitty gritty atmosphere of bars and rundown towns is effectively captured. Director Kusama (GIRLFIGHT) again proves herself as a strong female presence in films.